BUY IN BULK TO SELL AT YOUR FUNDRAISING EVENTS. Email Frances at info@loveliveshereintheusa.com for lower bulk pricing. Help Us Spread LOVE Across the Country and Raise Money for Your Organization! 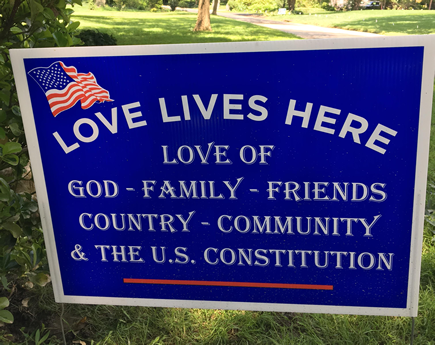 Show your LOVE with a 18″ x 24″ corrugated lawn sign. Includes stakes, packing, shipping and handling. Show everyone in your neighborhood and community that you are proud to Live In The US! so please be certain to purchase the correct size and item. Thank you for spreading LOVE in the USA!